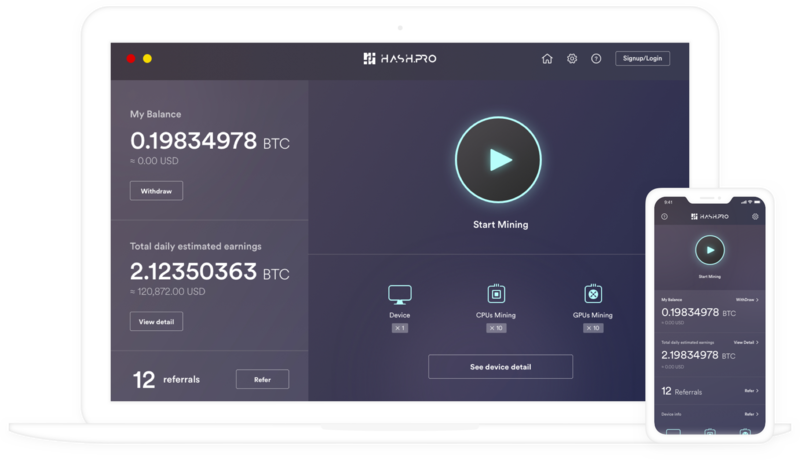 Today we are proud to announce the launch of our brand-new mining software: Hash.Pro Miner, which opens new frontiers for mining PoW cryptocurrencies. As solo mining of Bitcoin is currently not cost-effective at all, we propose the joint block solving solution, which means that you share your idle GPU and CPU power and connect with us, together every owner of computer within the Hash.Pro community will be able to earn rewards more often. The more people connect with Hash.Pro Miner, the higher block-solving frequency. With the Hash.Pro Miner account, you can track your device’s status, use mining calculator to estimate your earning, and withdraw your earned bitcoins, as well as buy our cloud mining contract. The essential feature of Hash.Pro Miner is its dynamic algorithm change, the system will automatically switch algorithm to mine the most profitable coins to maximize miners’ profits. All you need is a PC and internet connection, you can download the app for Windows version HERE, versions for Mac and Android will come soon. The daily mining profits depend on your computer’s performance, we estimate that one computer with 1080Ti Graphic Card will mine 0.7 USD daily profits. You can find all necessary information on how to set up Hash.Pro Miner on our webpage. Download Hash.Pro Miner now and start mining your first cryptocurrency!